For anyone representing lawyers, doctors, and other professionals or their spouses, one of the thorniest problems in divorce cases continues to be assessing the worth of the professional practice. 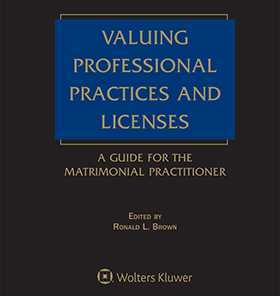 Valuing Professional Practices and Licenses has been used nationwide as the essential practice guide in this area of matrimonial law. Over 45 chapters newly revised by a team of savvy matrimonial practitioners offer complete and current information on the valuation of professional practices, degrees, and licenses. There is also coverage of difficult topics such as merger, double dipping, celebrity goodwill, and how to best represent clients in these complex cases. Plus, the updated Fourth Edition has been expanded and revised, with new chapters on key topics such as the difficulties of representing lawyers in divorces, the various factors included in the sale of a law practice relevant to valuation for divorce litigation, the effective use of financial experts, and the bankruptcy aspects of awards of professional assets. With Valuing Professional Practices and Licenses' legal analysis and expert commentary, valuation examples and explanations, sample reports, checklists and forms to use for discovery, and sample question-and-answer sequences, you'll be fully prepared to represent your professional clients efficiently and successfully.